This has been a difficult time for the LGBT community. As if all the current legislation across the country – and the heated rhetoric around it – weren’t enough, we are met with the embodiment of that conflict in the senseless loss of members of our queer family in Orlando. It is hard to imagine how we heal; how we move forward; how we persevere in the face of these attacks on our personhood. But, persevere we must! So, how are we to do that in the face of adversity? 1) Grieve. Allow yourself to feel and to hurt. It is normal and affirming. These feelings may range from denial or a sense of unreality, to sadness, to anger. These may occur in no particular order or intensity, because while we all experience these common feelings, they are filtered through our life experiences and how these experiences have informed our world view and sense of self. 2) But, don’t do it alone. Reach out to family, friends, community… to anyone you feel safe with. This is a shared experience, and in sharing it you promote healing through connection and community. We need to affirm our humanity and humanness, and there is no better way than through each other. 3) Do something pro active. These kinds of experiences make us feel helpless. Volunteer. Donate blood. Donate time or money. Care for others as they need to process their feelings. Go to vigils or participate in calls for social action. In doing what you can, you are helping. And in action there is healing that can combat helplessness and prevent you feeling immobilized. 4) Acknowledge your fears. If you are feeling fearful, this is also understandable and normal. Recognize it, however don’t let it stop you from engaging with others or doing what you enjoy. 5) Get professional help if you need it. These kinds of events not only hurt and are traumatizing as they occur in the moment, but they can bring up old, unresolved wounds. Be aware that, if you are struggling with moving forward, it may be due to old issues that are being triggered. If, instead of slowly recovering day by day, you find yourself feeling more and more sad, anxious, fearful, hopeless, helpless, etc., it may be helpful to seek out counseling. There are many of us, especially those therapists who are part of the queer community, that really want to help. Remember that we are here for you. 6) And lastly, try to work towards finding hope in what may feel hopeless. While we are all shocked, saddened, and angered by the discriminatory events that have occurred in this state and across the country, as well as the tragedy in Orlando, it is an amazing gift to see the outpouring of support and solidarity. It is heartening seeing how this is galvanizing. This is not to say that more steps backwards are not part of the journey of all movements towards full civil rights, but, at the moment, the din of the bigoted minority is being silenced by the cacophony of the majority as they are awakened by tragedy. I believe we can all see ourselves more clearly in the worldwide voice of love that unites us and is inviting us back into the fold. 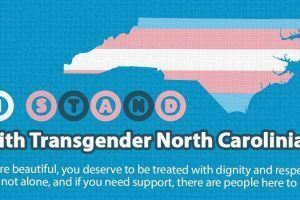 Michelle Topal, LCSW is an LGBT therapist in Raleigh & Durham NC, who specializes in LGBT issues child therapy, family counseling, parenting support & couples therapy Durham & Raleigh NC.